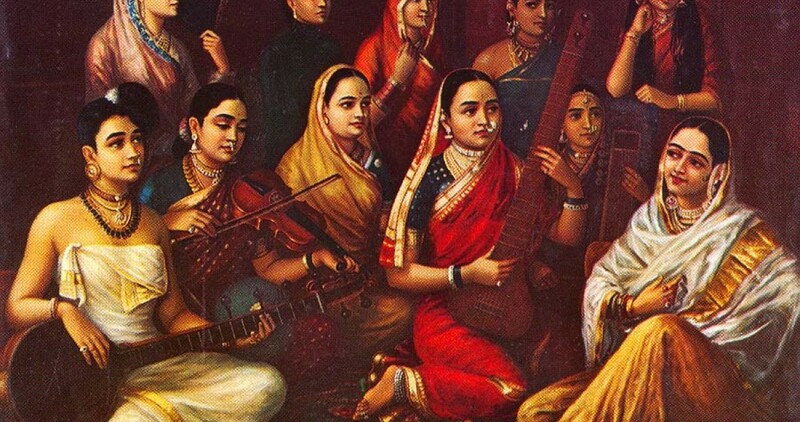 The respect and honour that vedic traditions had for women needs to be preserved, in order to address the turbulence which exists in modern society. Stephen Knapp(Sri Nandanandana Dasa) grew up in a Christian family, during which time he seriously studied the Bible to understand its teachings. In his late teenage years, however, he began to search through other religions and philosophies from around the world and started to find the answers for which he was looking. He also studied a variety of occult sciences, ancient mythology, mysticism, yoga, and the spiritual teachings of the East. He continued his study of Vedic knowledge and spiritual practice under the guidance of a spiritual master, His Divine Grace A. C. Bhaktivedanta Swami Prabhupada. Among the many societies that can be found in the world, we have seen that some of the most venerating regard for women has been found in Vedic culture. The Vedic tradition has held a high regard for the qualities of women, and has retained the greatest respect within its tradition as seen in the honor it gives for the Goddess, who is portrayed as the feminine embodiment of important qualities and powers. 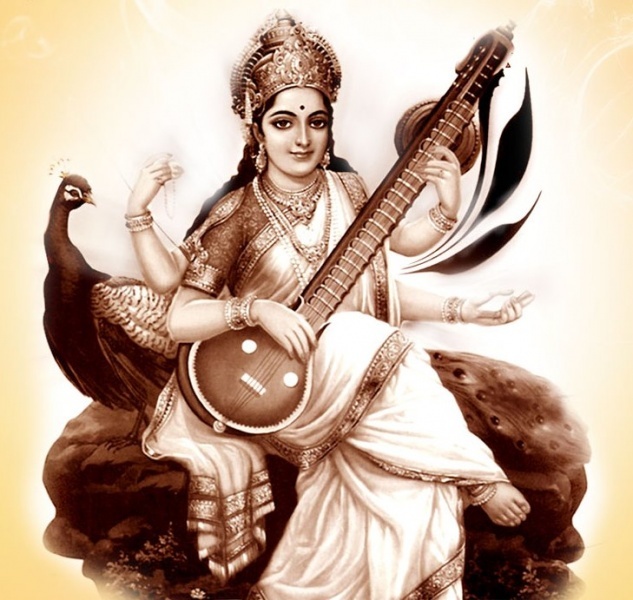 These forms include those of Lakshmi (the goddess of fortune and queen of Lord Vishnu), Sarasvati (the goddess of learning), Subhadra (Krishna’s sister and auspiciousness personified), Durga (the goddess of strength and power), Kali (the power of time), and other Vedic goddesses that exemplify inner strength and divine attributes. Even divine power in the form of shakti is considered feminine. 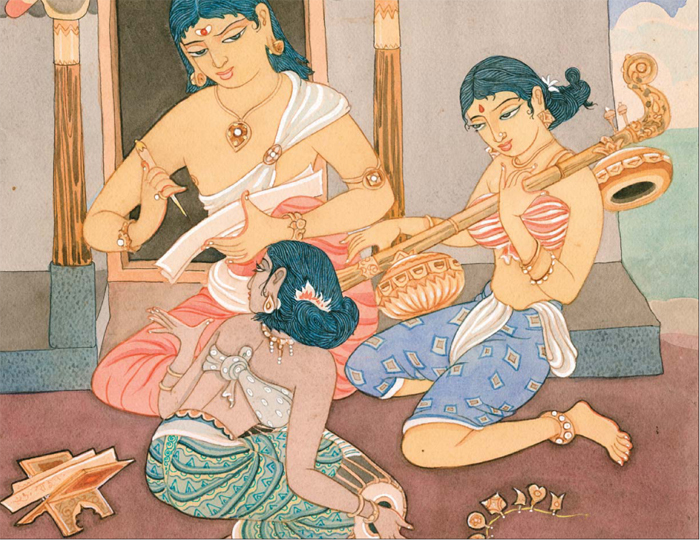 Furthermore, in the Vedas, when a woman is invited into the family through marriage, she enters “as a river enters the sea” and “to rule there along with her husband, as a queen, over the other members of the family.” (Atharva-Veda 14.1.43-44) This kind of equality is rarely found in any other religious scripture. Plus, a woman who is devoted to God is more highly regarded than a man who has no such devotion. Additional quotes can be found in other portions of the Vedic literature. This is the proper Vedic standard. If this standard is not being followed, then it represents a diversion of the genuine Vedic tradition. Due to this tradition, India’s history includes many women who have risen to great heights in spirituality, government, writing, education, science, or even as warriors on the battlefield. 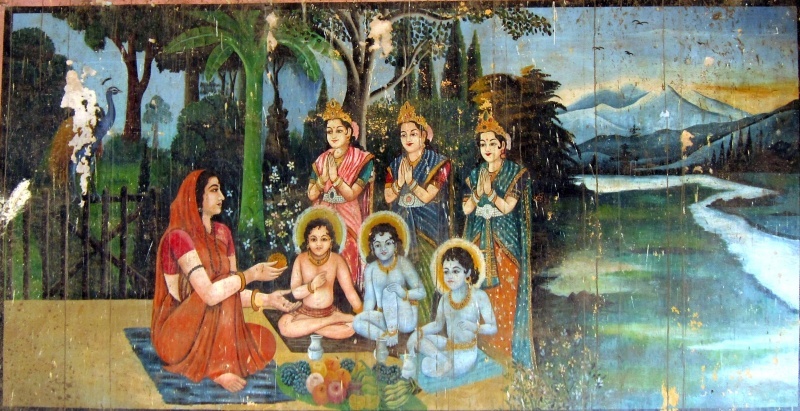 Anasuya feeding the_Hindu Trinity The Krishna-Sudama Temple of Porbandar. The way we treat our women is an indicator of our barbarism. Whereas men may have greater physical energy than women, the latter clearly have more internal and emotional energy. It is not without reason then that women are identified with shakti in Vedic civilization. If women are kept suppressed, this shakti will be denied to the family and the society, thus weakening all of them. In real Vedic culture it is taught that every man should view and respect every woman, except his own wife, as his mother, and every girl with the same concern and care as his own daughter. It is only because of the lack of such training and the social distancing from the high morals as this that this teaching is being forgotten, and the respect that society should have for women has been reduced. In this way, the change in the attitude toward women in India (and across the globe) was due to a loss of culture and of the true Vedic standards and a lack of understanding true Vedic spiritual knowledge. Thus, it should be easy to see the need for organizations that will keep and teach the proper views, which were once a basic part of the genuine Vedic traditions. Our own life is a gift from our mother’s life. We were nourished by her, we spent nine months in her womb, and her love sustained us. Even now we are loved by our mother. This includes Mother Nature and Mother Earth, which is called Bhumi in the Vedic tradition. The Earth planet is also like a mother because everything we need to live, all our resources, come from her. As we would protect our own mother, we must also protect Mother Earth. In exhibiting the qualities of motherhood, women must be warm and tender, strong and protective, yet also lay the foundation of discipline and the discrimination of right from wrong. Furthermore, in the home it is usually the woman who lends to providing beauty in decorating the house and facility for an inspirational atmosphere. Also, she must usually provide the nutritious and tasty dishes that give pleasure and strength for the fitness and health of the body. By their innate sense of motherhood and compassion, women also make natural healers, care givers, and nurturers. Those women who have this intrinsic disposition for caring will also be natural upholders of moral standards and spiritual principles. By their own emotional tendencies and expressions, they are also natural devotees of God. 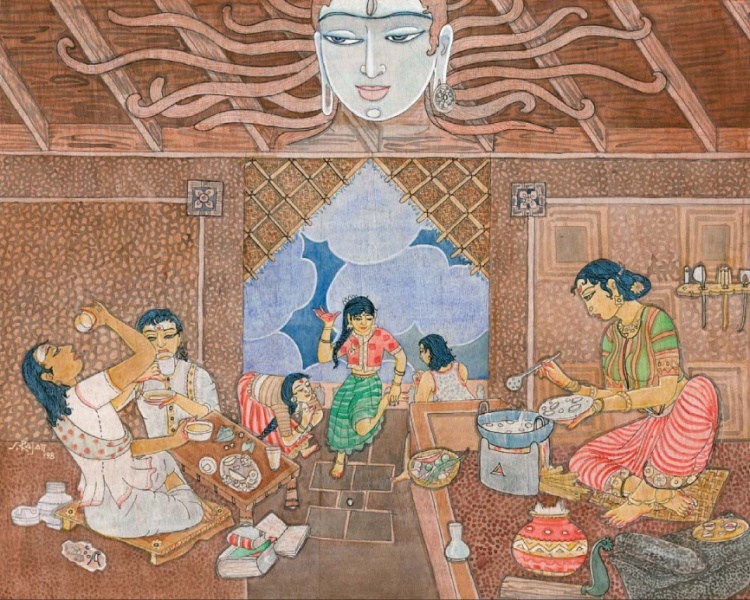 In ancient India the Sanskrit words used by the husband for the wife were Pathni (the one who leads the husband through life), Dharmapathni (the one who guides the husband in dharma) and Sahadharmacharini (one who moves with the husband on the path of dharma–righteousness and duty). This is how ancient Vedic culture viewed the partnership of husband and wife. When a husband and wife are willing to be flexible to each other’s needs and move forward in love and mutual understanding, the relationship can go beyond equality to one of spiritual union. This means that each one appreciates the talents of the other, and views the other as complimenting what each one already has. This also makes up for the weaknesses or deficiencies of the other. In this way, each can provide support, encouragement and inspiration to the other. This ideal can only be achieved when they properly understand the principles of spirituality. It is also said that where the husband and wife get along well, Lakshmi Devi (the goddess of fortune) Herself dwells in that house. Through the medium of pure affection, the feminine Divinities have been able to break down the most powerful citadels known to creation, especially those of evil. The divine mystery of life is that the most powerful forces of the universe are subjugated by love, and that love is most completely channeled through the feminine energy and personality. For example, “Durga” means the one who is difficult to know. Yet, being considered the mother of the universe, or the personification of the material energy, we as her children can approach her through love. And she will respond with love. Out of love also the Divine feminine potency manifests as Srimati Radharani, the consort of Lord Sri Krishna. One of her many names is Janagati, which means the goddess of all goddesses. She is the origin of the divine feminine love and beauty, and the epitome of devotion to the Supreme Being. Thus, from the ideal spiritual world, we can see Her divine reflection mirrored here in this relative world in all that is feminine, beautiful and pure. By being conscious and aware of such qualities, we can perceive the spiritual dimension pervading and flowing throughout this temporary material universe. Thus, we recognize the very qualities of the Divine Persons from whom they originate in the spiritual world. We humans are but limited reflected forms of the Divine Couples who reside in original existence. This is why the Vedic tradition placed much value in honoring and worshiping the Divine feminine nature along with the masculine–one without the other is incomplete. This is one of the unique traits that distinguishes Vedic culture from others. It is the primitive customs as well as the sexist inventions in modern but materialistic society that force social trends to limit, subjugate or even exploit women in today’s world. Such a society does not allow the strength or ingenuity of women to arise or be recognized, at least not without a struggle both inside the mind of women and outside in the field of activity and occupation. A faulty beginning or childhood, as well as exposure to thoughts and ideas and indoctrinations of one’s limitations rather than of one’s superior potential is one of the reasons why women lose their ability, means or motivation for higher accomplishments in life. This often causes their spirit of achievement and contribution to be squelched. This only adds to the struggle of women which is often passed along from one generation to the next. Thus, all of society loses the capabilities that women could otherwise attain and provide. Harmony needs to be restored between the masculine and feminine natures, which are especially exhibited in the relations between men and women. This can be done most effectively through genuine spiritual development, when both masculine and feminine natures become balanced and complementary rather than competitive. This can harmonize not only the external relations between people, but also the feminine and masculine tendencies within each individual, both men and women. By genuine spiritual progress we can rise above our bodily material identities and work with and compliment the talents and abilities of others, regardless of whether they are men or women. We must know that within each body is a spirit soul that is no different than our own. But while we are in this world and in different types of bodies, we can work cooperatively for our survival and for harmony among us, and use our naturally varied talents together.